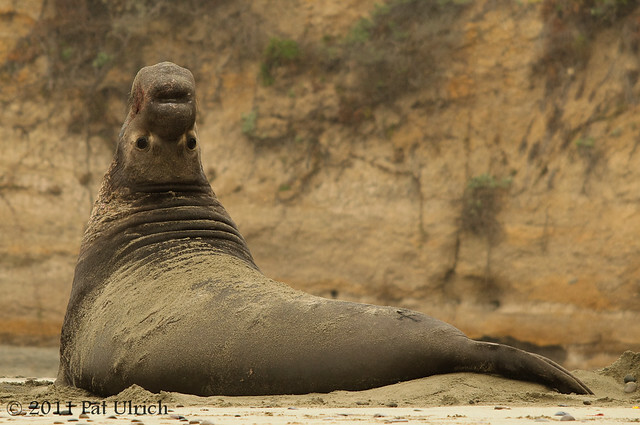 Two images of this male northern elephant seal displaying on the beach at Año Nuevo State Reserve. 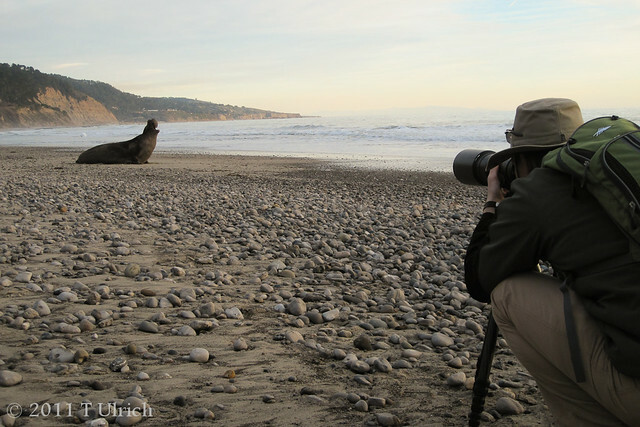 Not only did we find this lively seal to photograph, but we were also treated to a beautiful California sunset on this early January day as well. 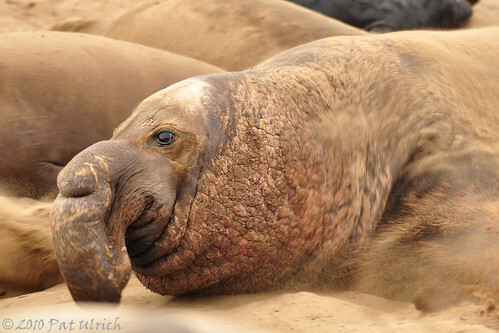 View more of these powerful animals in my elephant seals gallery. 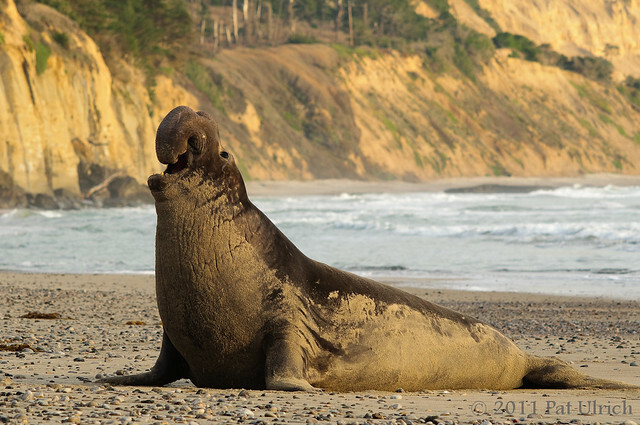 A male northern elephant seal coming out of the waves on onto the beach at Año Nuevo State Reserve. 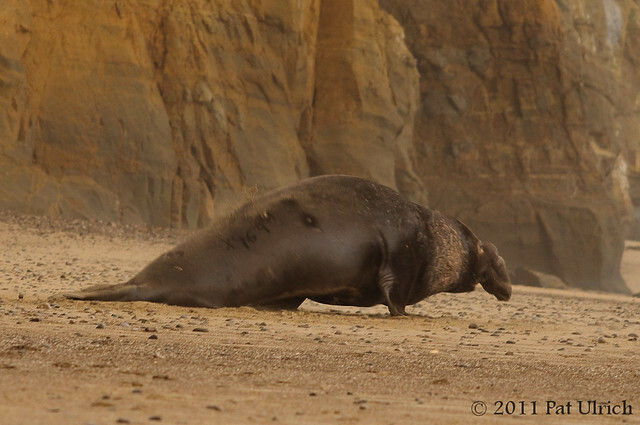 This guy took a slow and calculated approach to the beach, as he sized up the resident bull he was going to challenge. I included a video of their encounter on my post for yesterday, so check it out if you haven't already. 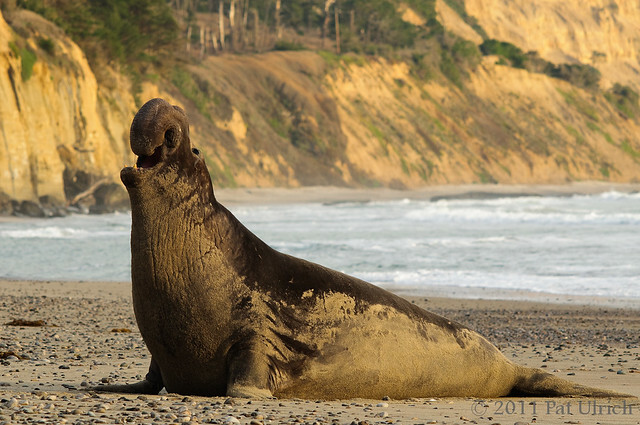 One of the coolest wildlife encounters we've had occured last weekend with the northern elephant seals at Año Nuevo State Reserve. After a drizzly afternoon spent watching the seals on the beach, we had decided to just sit and relax and watch the ocean for a while. 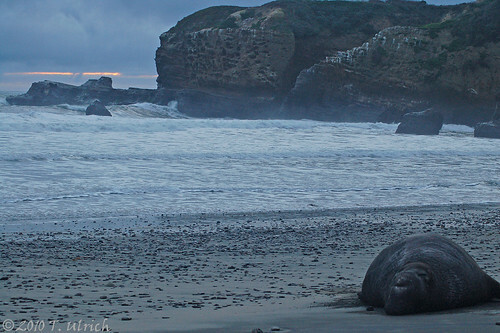 Just as we were considering heading home, since it looked like we were going to get fogged out of a sunset, we noticed that a male elephant seal was in the water along the shore. 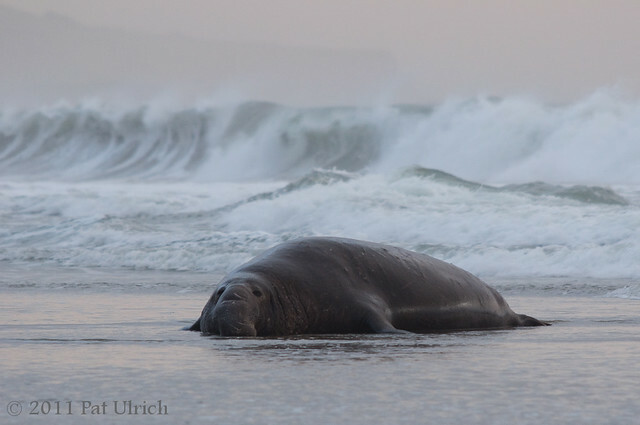 We watched his progress, and it looked like he was going to attempt to haul out on the same stretch of beach where a large bull was already situated. 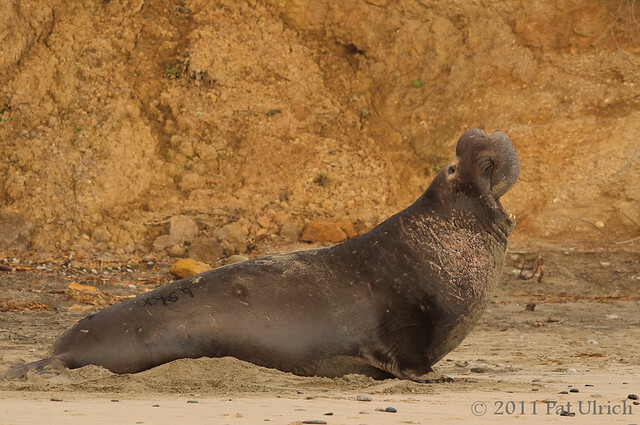 It's been a dream of mine to photograph an elephant seal battle, so we quickly moved into position to watch the action. The encounter was fantastic, but unforutnately there was no fight. Once the two males squared up, the challenger decided it wasn't worth fighting, and made a hasty retreat back to the water. I have a series of images with some descriptions from the encounter below, and then at the bottom of this post is the video that my wonderful wife took of the event. You definitely should watch the video, its really awesome to see them in action! 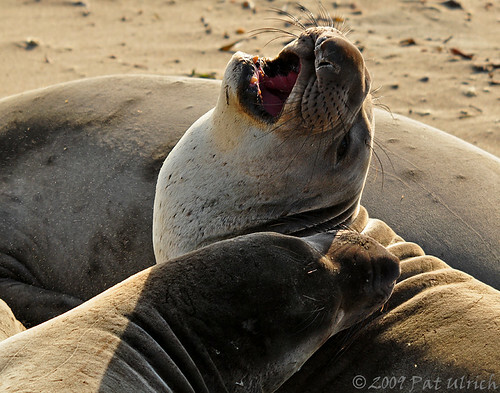 The above image is of the dominant seal as he displayed his might to the newcomer that just came out of the waves. Up to this point, this bull had been pretty quiet all day -- occasionally displaying and making his gurgling sound, but not really interested in moving around all that much. But when he saw the challenger come out of the water, he became much more animated and quickly turned to face the water and pulled up in this fighting posture. 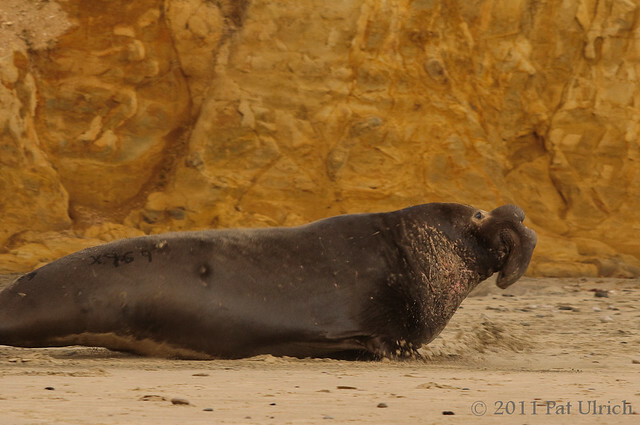 Then he took off down the beach, charging at the challenger. It was really amazing how quickly they moved. 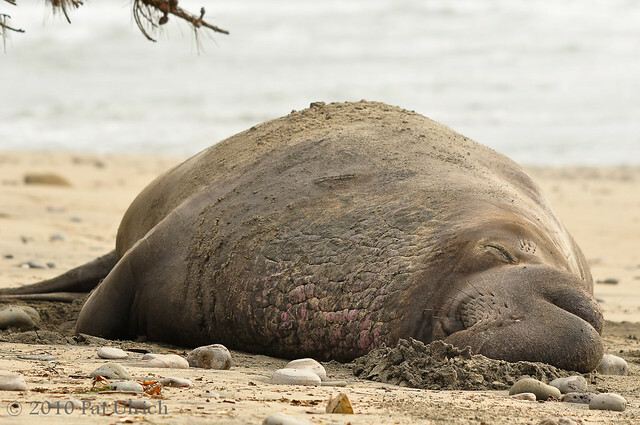 When you see these giant slug-like creatures on the beach, you wonder how they could possible move as fast as the rangers tell you. 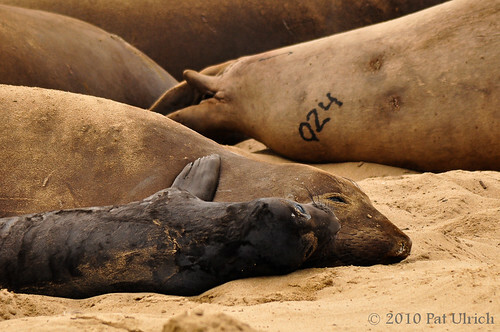 The rule is to stay 25 feet away from the seals at all times in the reserve, and the docents tell you that's because a seal can run faster than you for the first 12.5 feet. I'm sure there's a bit of hyperbole in there, but after witnessing this, it doesn't seem too far fetched. The dominant bull pulled up in the middle of his sprint (after closign about half of the distance to the challenger) and he again took up an aggressive posture. This is the battle position, where they stand up tall and are ready to swing their necks at each other and bite and tear with those large front teeth. 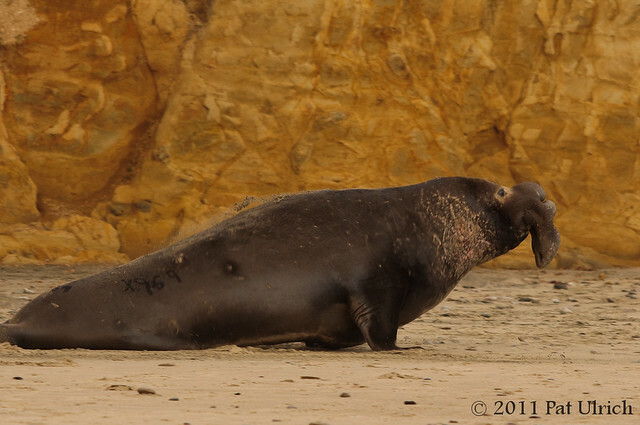 This kind of fighting is how they form those very large chest-shields of scar tissue that you see on the males. After this mid-sprint display, he again took off and continued charging. One interesting thing that showed up in the still images that we didn't notice in person, is how they really push their entire weight up on their "fingertips." 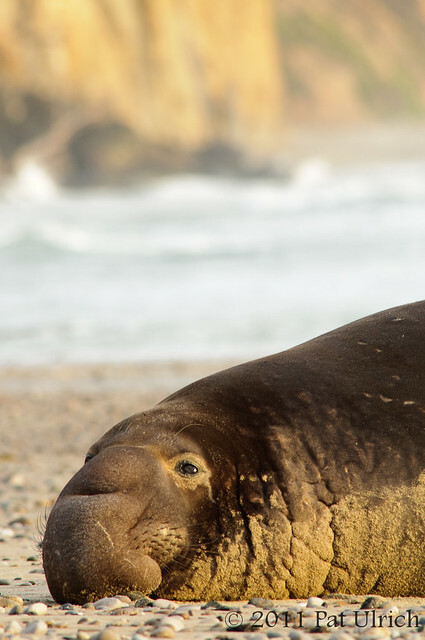 It looks like they are actually doing a pushup with those front flippers, which is pretty amazing since the largest bulls can weight up to 5000 pounds! This shot is when the two met in the middle. In fact, the challenger did not approach at all during the charge, he just waited for the beachmaster to come to him. They got this close (just far enough away that they couldn't bite) and each bull exhaled a breath of hot air that you can see in the image as they sized each other up. 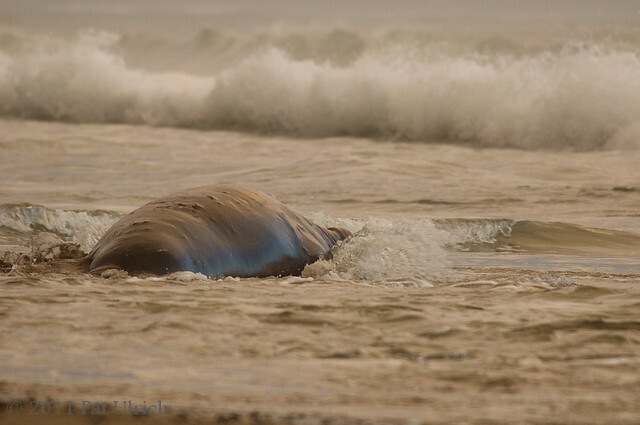 Then, after just a short moment like this, the challenger turned on his tail and ran for the ocean. Their battles are notoriously viscious, and it's no wonder that he didn't want to fight. This is not prime real estate, as there are no females on this beach to take into your harem if you win. 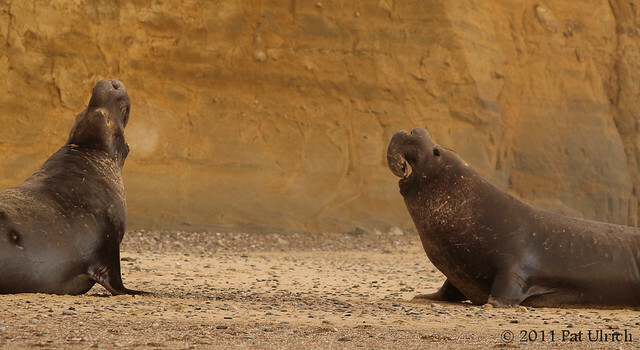 This standoff occured on Loser's Beach. They both moved really fast during this portion of the chase (pretty cool to see in the video! ), and in this very unsharp frame, you can see just how high the beachmaster was able to push his body off the ground during his mad dash. 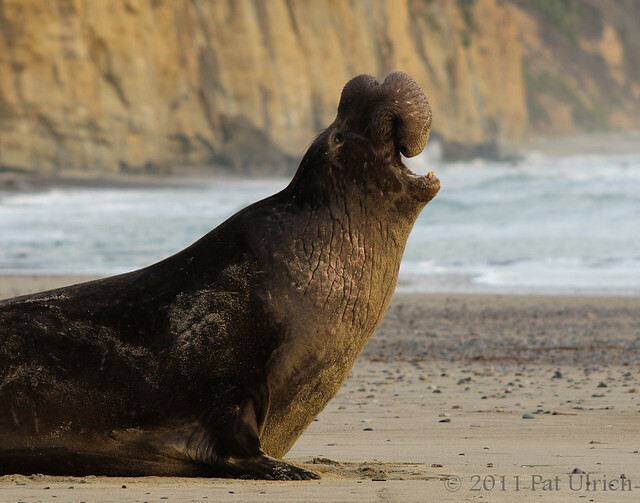 The dominant male pulled up once he was sure that the other was on his way off the beach, and as you can see in the video, he seemed to celebrate with an air of "This is my beach -- anyone else want to mess with me?" The challenging male didn't stop running until he hit the water, and then he slowly moved off over the next 5 minutes or so. And now, what you've all been waiting for, a video of the action. It took the challenger a short while to come out of the waves and onto the sand, at which point the current beachmaster charged at him. I've shown an abbreviated version of the challenger's approach in the video. After each short burst of motion in his advancement, he would flop back to the ground and wait for a few minutes before starting to move again. It seemed like he didn't want to waste extra energy, but also to size up the bull he was challenging. Enjoy the video, and watch for the dive-bombing pelican in the background at around 5 seconds in! 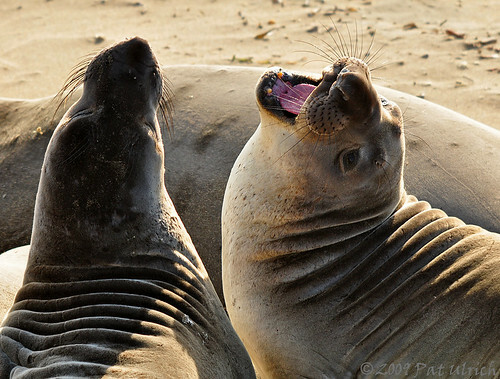 See more images of these awesome marine mammals in my elephant seals gallery. 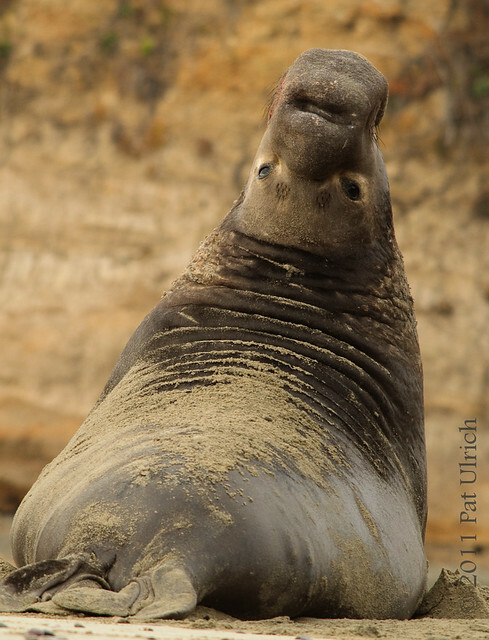 A large bull elephant seal glancing my way at Año Nuevo State Reserve. 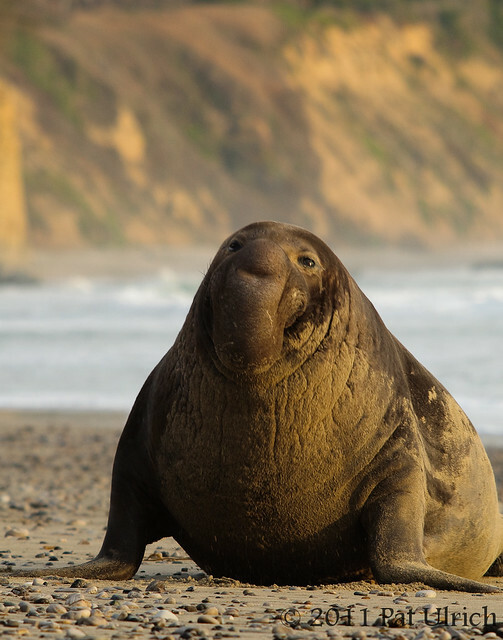 This big bloke didn't seem to mind us being on the beach with him, which is no surprise since he received a steady stream of visitors, but he periodically wanted to check where we were. 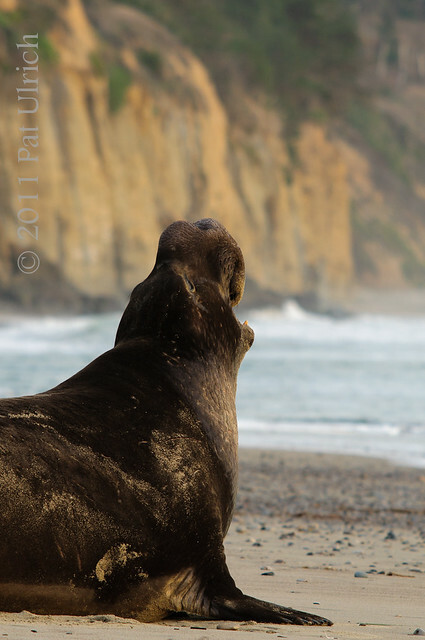 For these shots, he was turned to face the trail that came down to the beach, and was displaying as new visitors arrived around the bend (I suppose he wanted to make it clear that he's the owner of this territory). After showing off for them, he often would glance back our way to make sure that he knew where we were. 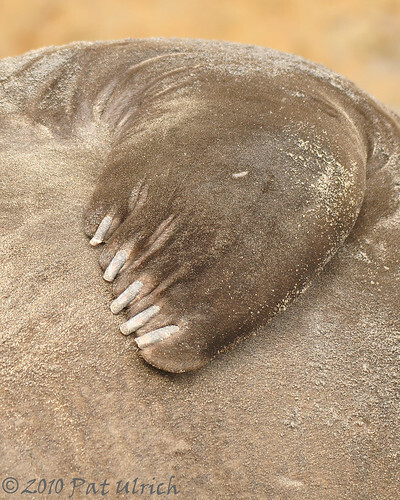 There was one time when my wife had gone a bit further down the beach to check out the really cool fossil-filled rocks there, and he glanced over backwards like this in my direction. 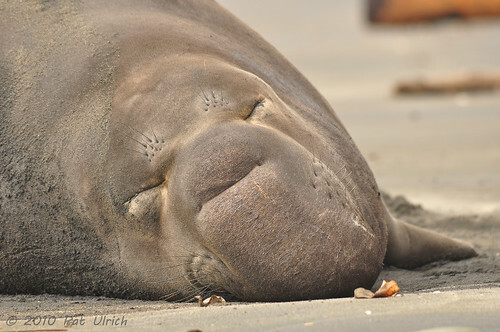 When he saw only me, he noticeably started scanning the beach until his gaze found her location, and then he put his head down and closed his eyes again. Just keeping tabs on the visitors in his domain, I suppose. 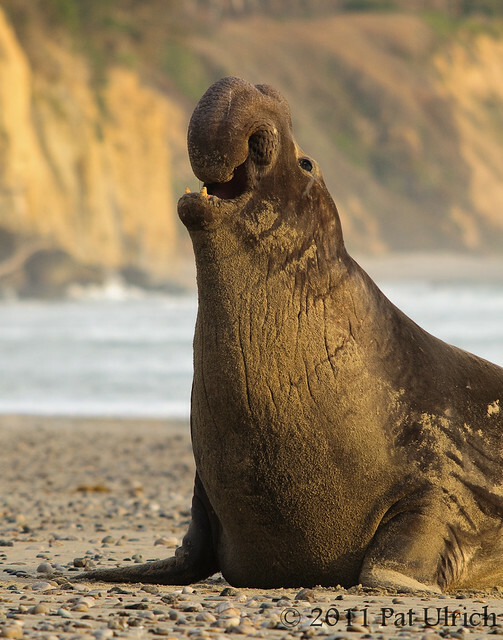 It's fascinating to see such a large animal like this (the northern elephant seal is the second largest seal species in the world, smaller than only the southern elephant seal) be so flexible. 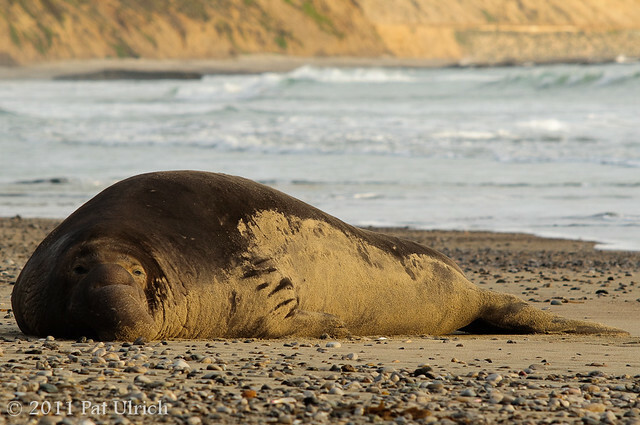 It's not so surprising to see the much smaller harbor seal contort its back, or certainly a California seal lion, but it's pretty incredible to see one of these brutes bend over backwards. A quieter moment on the beach compared with my previous post of this guy. 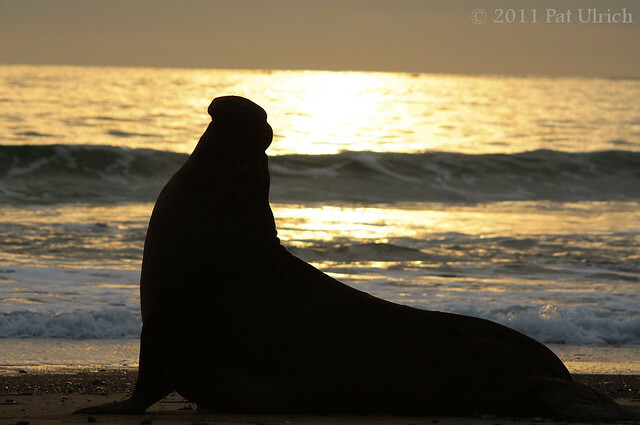 Even though they are huge, I still think they can have the cute expression of a friendly dog -- and I swear I can see him smiling in this one while he enjoys the sunset! 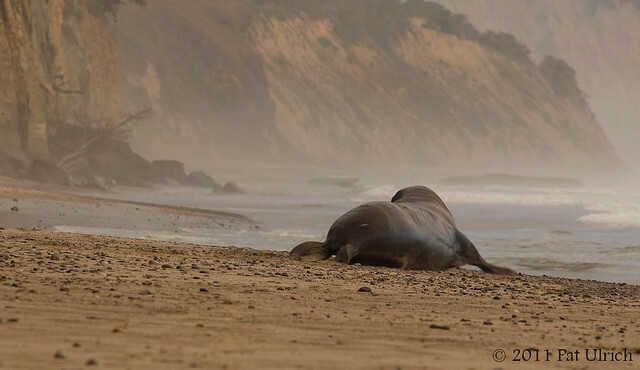 Two shots of a male northern elephant seal resting on the beach at sunset in Año Nuevo State Reserve. 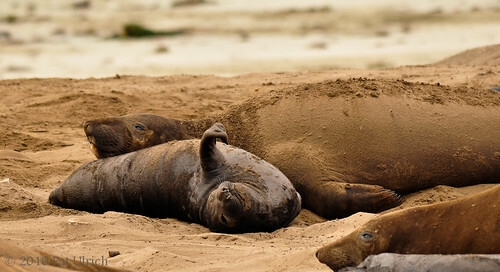 Its fun to watch them display and make their very unique vocalizations, but most of the time they are just relaxing in the sand. 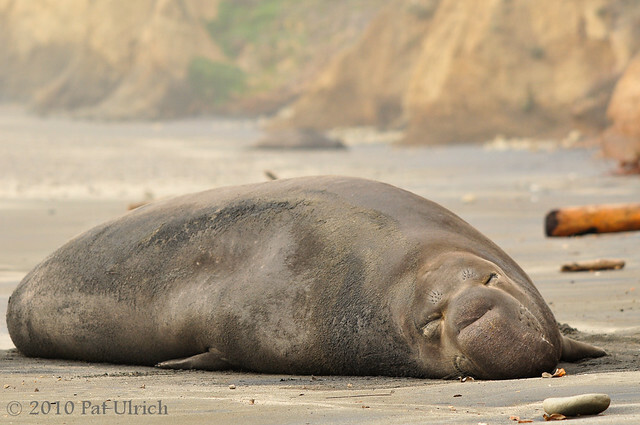 Around this time of year at Año Nuveo State Reserve, most of the adult northern elephant seals have gone back to sea, and all that's left are the weaners (the term applied to the young seals that have been weaned and left behind to fend for themselves). 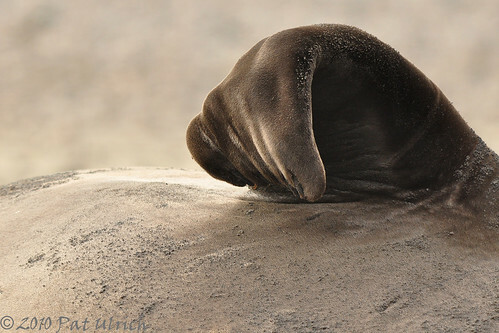 The shots in this post are from when the seals are much younger, only a few days after they are born in January. 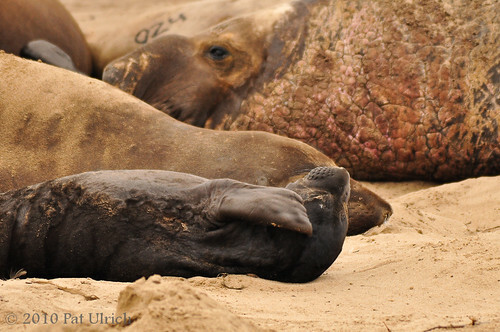 Our annual winter trip was full of babies this time, and it was great to be on the ground-level with them. 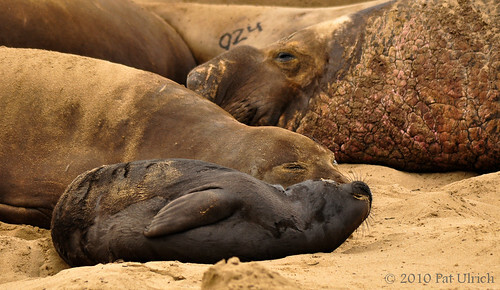 When these cute little pups are born they're jet black, weigh around 75 pounds, and live on a diet of their mother's very rich milk (over half of it is fat). In the 28 days or so that they nurse they'll gain around 10 pounds a day and weigh upwards of 350 pounds when they are weaned. This is an incredible growth spurt, and it is quite taxing on the mother who fasts during her entire stay. 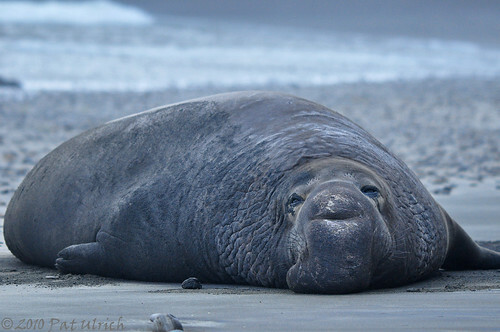 ...its not all about lounging on the beach, feasting, and looking cute. 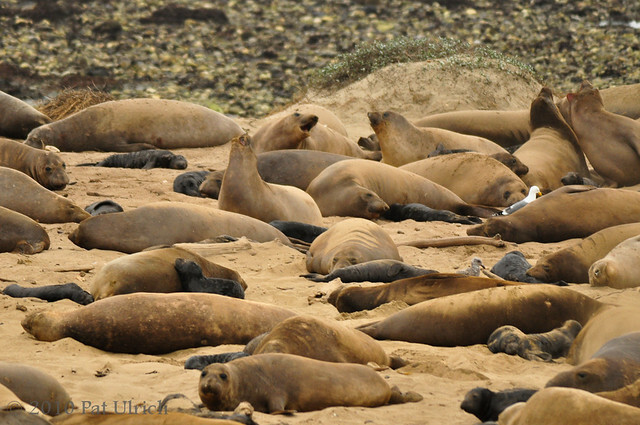 After those relatively easy first four weeks their mothers will disappear back into the ocean, and the pups are very suddenly weaned. At this point they are completely on their own, and need to figure out how to swim, and even how to eat. 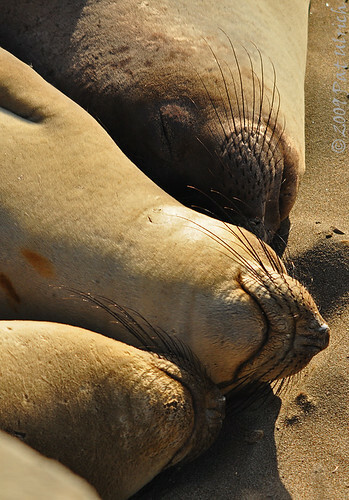 By the end of April the self-taught pups will follow their instinct and head out to sea. Amazingly, they'll all individually head north to feed along the coast and won't touch land again until they return to this same beach in September. 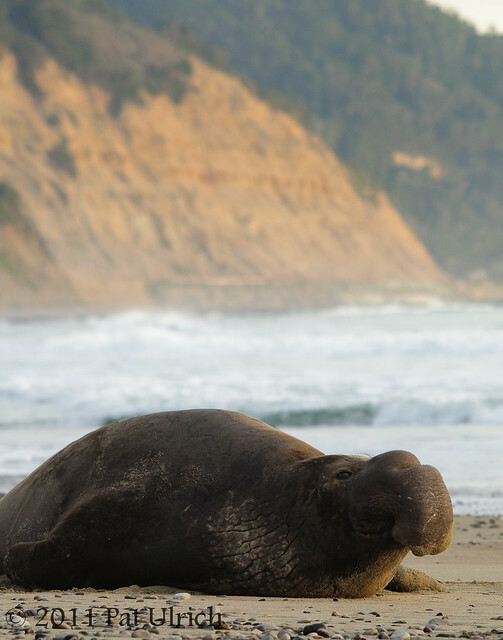 An elephant seal beachmaster defends his harem at Ano Nuevo State Reserve. 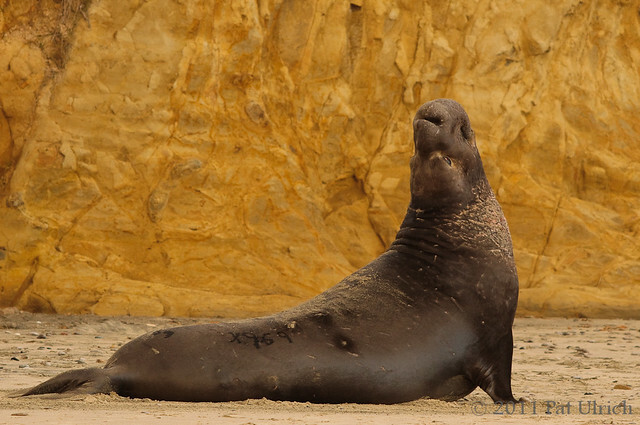 This was probably the largest alpha male that we saw on this trip, and he was a real brute. You can see how the chest shield of scar tissue that forms during their brutal battles extends nearly around the back of his neck, which means that he has done some serious fighting throughout his life. His reward for this is to be the chief protector and only mate of a harem of ladies. In the above shot, he is moving at full tilt to fend off another male intruder. One of the females in the harem was calling loudly for a few minutes to alert the alpha male that she was uncomfortable with this newcomer, and once he decided to respond he moved quite quickly through the harem. 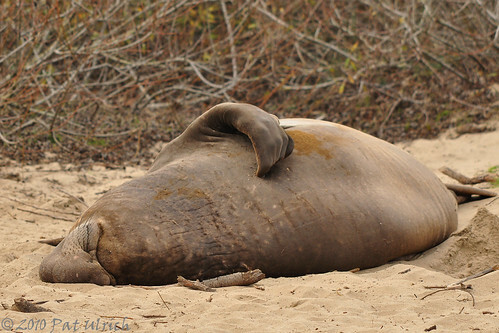 The challenger was behind the dune from where we were standing, but apparently backed down since we didn't get to see a fight, and the alpha male then settled down for a nap where he stopped. Watching him move his huge mass so quickly was really awesome, he is surely a force to be reckoned with. Unfortunately, he was moving too fast for my shutter speed in the overcast light, and this was the only sharp frame I got of his burst. 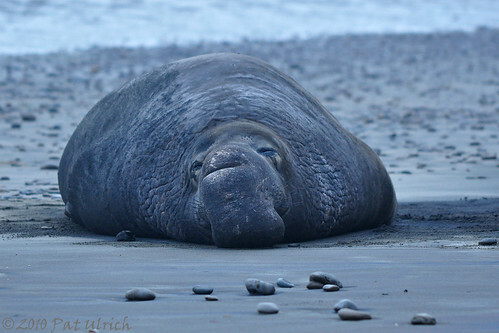 This is a more traditional shot of the beachmaster, and why they call them elephant seals. 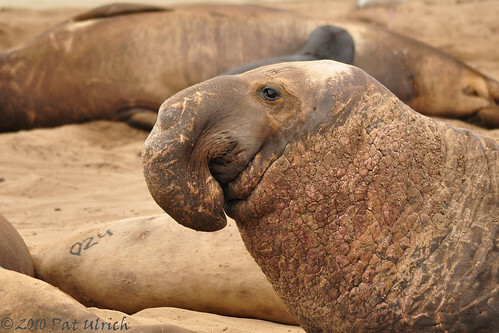 It really shows off his long proboscis which is covered in scars from his battles and his serious chest shield. 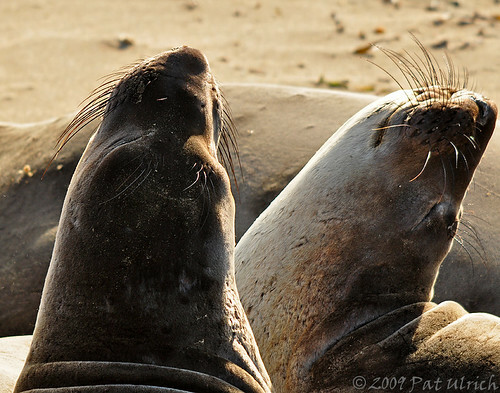 It is truly an awesome experience to be in their presence, and especially on the beach with them. 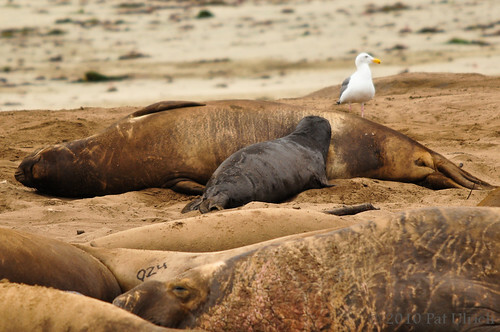 A trip to Ano Nuevo State Reserve is a must for any wildlife lover in the area!